This review first appeared in the July 2009 issue of hi-end hifi magazine High Fidelity of Poland. You can also read this review of the Krell S-300i in its original Polish version. We publish its English translation in a mutual syndication arrangement with publisher Wojciech Pacula. As is customary for our own reviews, the writer's signature at review's end shows an e-mail address should you have questions or wish to send feedback. All images contained in this review are the property of High Fidelity or Harbeth. - Ed. 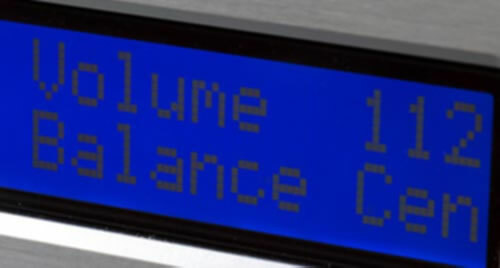 Hi-end devices have clear personalities apparent in either their specific cabinet design, functionality or sound. It's never good to generalize but there is some truth to that. When we say Accuphase, we think of a precise, thorough but also somewhat sweet sound. We say Bowers and Wilkins and imagine strong heavy bass, a very clear midrange and an expressive treble. And we can continue with Krell where many readers will associate cold, clinical, impersonal, strong, dynamic and precise. These qualities can be put in any order. While in many cases a company sound can be readily identified and remembered, with Krell it is different. I was never a fan of their cheapest integrated amplifiers mostly because they demanded high-class expensive loudspeakers and sources to sound right. Surrounded with cheap components and cables, they sounded exactly as described. But the case is completely different with the more expensive Krell components. I remember well my time spent with the EVO 222+402 set; and the amazement of friends who could not believe how smooth and intense it sounded; and that the last thing anyone should have mentioned was brightness. There simply was no trace of it. Of course my Harpia Dobermann speakers and cabling were part of that success but still, Krell delivered a very strong show of character. I was similarly impressed by Krell's presentation during the IFA 2007 based on the mighty Evolution One power amplifiers. That really was something! in looks, sound or built quality. Still for many, crafting a hi-end audio machine behind the Great Wall will seem like the Great Betrayal. I am not here to solve such dilemmas. Everybody will have to on their own. I am here to listen. Discs used for the test: Meyer Records. Vol. 2, Meyer Records, no. 159, 180gr LP; Stockfisch Records. Vinyl Collection, Stockfisch, SFR 357.8006.1, 180gr LP; Thorens. 125TH Anniversary LP, Thorens, ATD 125, 3 x 180gr LP; Carol Sloan, Hush-A-Buy, Sinatra Society of Japan, XQAM-1031, CD; Count Basie, Count Basie plays, Joe Williams Sings Standards, Verve/Universal Music Japan, UCCV-9233, CD; Depeche Mode, Sounds of The Universe, Mute/EMI Music Japan, TOCP-66878, CD+DVD; Depeche Mode, Sounds Of The Universe, Mute, STUMM300, 2 x 180gr LP; e.s.t., Leucocyte, ACT Music+Vision, ACT 9018-1, 2 x 180gr LP; Isao Suzuki, Blow Up 2, Jazz Fine, JFIS-001, XRCD24 + DVD; Kate Bush, Aerial, EMI, 3439602, 2 x CCD; Kraftwerk, Tour The France, EMI, 591 708 1, 2 x 180gr LP; Lars Danielsson, Mélange Bleu, ACT Music+Vision, ACT 9604-2, CD; Madeleine Peyroux, Careless Love, Rounder/Mobile Fidelity, Special Limited Edition, 180gr LP; Mel Tormé, Oh, You Beautiful Doll, Past Perfect, 904333-980, 180gr LP.